Need a little help figuring out how long it should take to finish each LIFEPAC? If so, the LIFEPAC Study Guide is just what you need! This easy-to-use Alpha Omega curriculum checklist pad has helpful columns made for determining target dates for completing LIFEPACs. Pages also have step-by-step check mark boxes. Measures 8 ½" by 11". Includes 50 pages. Not quite sure how long it should take your student to finish a LIFEPAC worktext? Wish you had a LIFEPAC resource to help you determine realistic completion dates? Well, you can stop wishing because Alpha Omega Publications has exactly what you need. It's the LIFEPAC Study Guide! This handy checklist pad contains helpful columns made for determining target dates and goals for completing LIFEPACs. Isn't that great? Imagine no more having to guess how many pages your student will have to do to complete each LIFEPAC! Now you'll know for certain. And you can use this Alpha Omega curriculum chart for any LIFEPAC worktext that contains up to 100 pages. But there's more! The LIFEPAC Study Guide also has handy check mark boxes that allow you to track each step of studying the LIFEPAC. Check mark boxes are included for beginning the LIFEPAC, for each section completed, and for after the student has completed the last self test. Using this helpful chart, you can rest assured you will never miss a study step again! Plus, this LIFEPAC resource, which contains 50 tear-off pages, allows you to easily document your student's progress through every LIFEPAC worktext. Great for future reference, these pages can also be added to your student's homeschool records! So why wait? 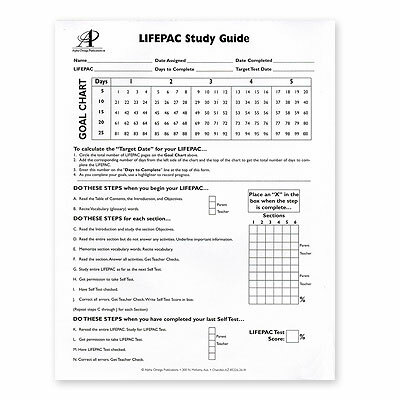 Get organized today with the very affordable LIFEPAC Study Guide. Order yours now!